USR-C322 is a wifi module released by USR IOT,which has the features of minisize,low power and industry-grade. 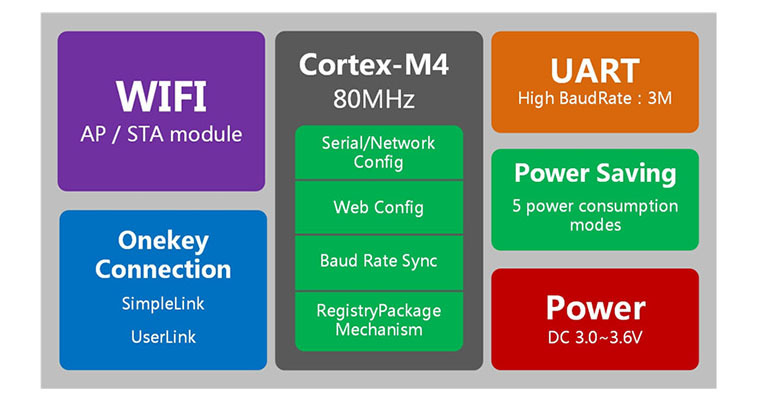 The hardware of USR-C322 wifi module integrates MAC,baseband chip, RF transceiver unit and power amplifier. 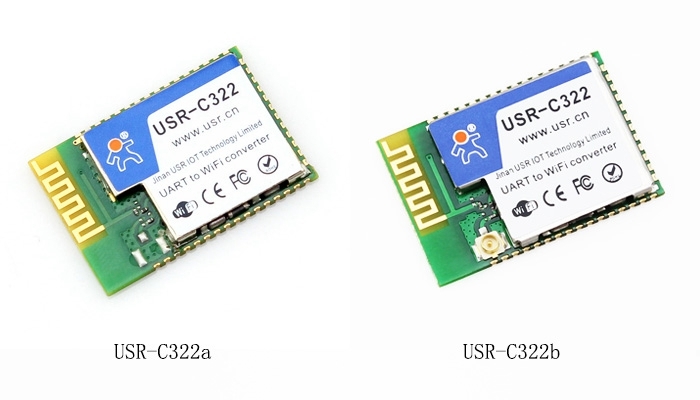 USR-C322 wifi module adopts CC3200 chip of TI,which has industrial ARM Cortex-M4 core and ultra-low power operation mechanism.And it supports WiFi protocol and TCP/IP protocol.User can achieve the function of UART devices connecting to Internet with simple configuration. C322 supports five power modes,which has Min.3.5mA standby power and has Min.25uA deep sleep power.Its power control can be the highest level. The above is function structure chart of C322 firmware V2.0.Blue part is for original function, orange for new features of V2.0. New features of firmware V2.0 includes double serial,three links,PC1 Encrypt,SSL encryption submission,http and Websocket communication mode. C322 has double serials and three network links. UART 0 supports two network links and one link supports TCP Server;UART 1 supports one network link. C322 built-in webpage supports user-defined functions. C322 supports function of Ethernet to serial, which adopts HTML5 Websocket technology. Combined with custom webapge function, User can design built-in webpage to realize webpage control and data acquisition according to project requirement. High-speed Baud Rate : serial baud rate up to 3Mbps; have high speed in large amount of data transmission applications like WIFI printer,WIFI serial camera and WIFI high-speed data acquisition. Onekey WIFI Connection : support two fast networking ways–“SimpleLink” and “UsrLink”;perfectly solve problems of complex networking operation in smart home applications. RegistryPackage Function : send registry data package immediately after TCP connection,which is convenient for server identifying and processing;registry data package supports custom ID and MAC. Baud Rate Sync : support using USR Visual Serial Software（USR-VCOM）. In industrial field：positioning low power and industrial-grade WIFI module; can adapt to industrial environment of – 40 ~ 85 °C; TI’s great repetation also can guarantee the stability of core solutions in industrial environment; Amazing power control can adapt to any requirements. In civilian field：positioning high-end intelligent civil products; support SimpleLink and UsrLink onekey APP networking mode.